2017 was TOUGH. I'm so grateful for the continuous support and encouragement I've received. I will have 'official' totals for the number of food banks (about 165/200) and number of marathons (94/100) SOON. Hunger remains everyone's burden, but I still firmly believe this is a wholly solveable problem. THANK YOU for donating. Whether directly through this page or as a participant in The Year of CHANGE (a Facebook event). Your impact: $1 = 10 meals. That's incredible. 1. Volunteer at every food bank in the Feeding America network. ALL 200+ OF THEM. 2. Educate the general public on what food banks are, and the crucial role the nation's food banking system plays in the fight against hunger. 3. 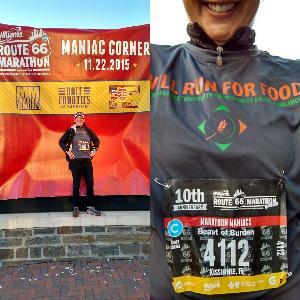 Engage and galvanize the running community in the fight against hunger. I will continue to be run a race in each state while I continue to strive for the goal of volunteering at every food bank in the Feeding America network. Once again, thank you for your support. How we deal with hunger *right now* is a defining moment of our nation's collective history. Hunger is at the crux of so many social ailments. Together, we can end hunger. NOW. It's time. Feeding America is the leading domestic hunger relief organization with a nationwide network of 200 food banks. As individuals, charities, businesses and government, we all have a role to play in ensuring every family has enough to eat and the Feeding America network of food banks is leading the charge in communities across the country. Every dollar you give helps share 11 meals with families, children, and seniors across America.